I’ve always been curious about spaghetti squash and until this past weekend, I had never cooked with it. A variety of winter squash, it is oblong-shaped with a hard, pale yellow rind and stringy, orange-colored flesh that resembles translucent strands of pasta when cooked. Its texture is slightly crunchy, somewhat akin to al dente pasta. Its season starts in early fall and goes throughout winter. Spaghetti squash is low in calories and is a good source of fiber as well as nutrients like beta carotene, folic acid, Vitamin A, and potassium. It makes a low carb and tasty alternative to pasta or potatoes. The method of cooking affects the flavor of the squash. Baking it in the oven for about 40 – 45 minutes will caramelize the sugars in the squash, resulting in a sweeter flavor. If you are in a hurry or want a milder flavor, cook it in the microwave for about 8-10 minutes. I prefer the oven method, despite taking longer, as the squash browns beautifully and develops deeper flavor compared to the quicker, microwave method. I found that the hardest part about working with spaghetti squash is cutting it in half. An uncooked squash has a tough exterior and its irregular shape can make it hard to firmly grasp. Using a sharp knife, I first pierced the squash and then cut all the way around. Alternatively, you can cook the squash whole, piercing the outer rind all over with a fork. Once cooked, it will be easy to cut. 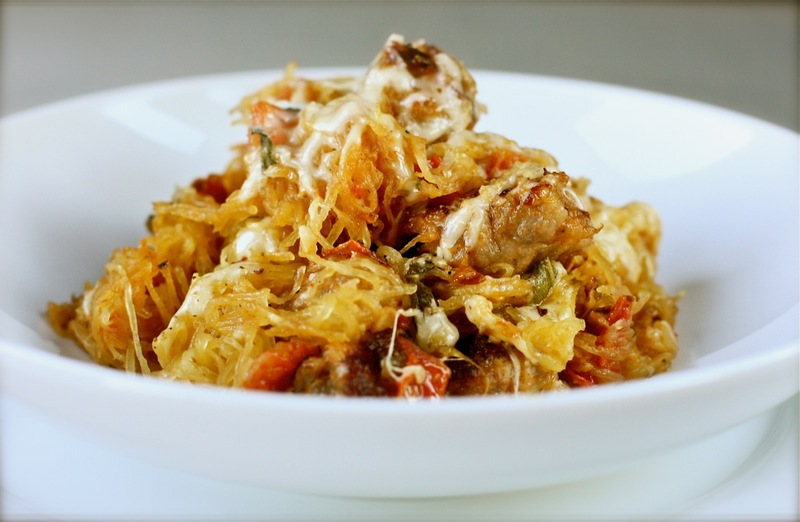 In this recipe, strands of spaghetti squash are cooked with sweet Italian sausage, roma tomatoes, and sage and topped with a blend of four types of cheeses – Parmesan, Asiago, Fontina, and Provolone. This makes a great side dish, but it is filling enough for lunch or dinner as well. This recipe may be easily modified to be vegetarian dish and it’s naturally gluten-free. Heat oven to 375°F. Brush a sheet pan with 1 tablespoon of olive oil. Set aside. Carefully cut spaghetti squash in half lengthwise. Scoop out the seeds and fibrous strands with a spoon, then place cut side down on the prepared sheet pan. Bake for 40 to 45 minutes, or until the squash is browned on top and the flesh separates into strands easily. Scrape out the squash into “spaghetti” strands with a fork and place in a bowl. Set aside. While squash is baking, remove the sausages from the casing and cut or pull apart into small, bite-sized pieces. Set aside. Heat the remaining olive oil in large sauté pan or cast iron skillet over medium heat. Add shallots and garlic and cook until soft and fragrant, about 1 minute. Add tomatoes and cook for 1 minute, stirring occasionally. Add the sausage pieces and cook for about 3 to 4 minutes, until sausage is cooked through and is no longer pink inside. Add the chopped sage and spaghetti squash strands and stir to combine. Season with salt and pepper, to taste, being mindful of the saltiness of the cheese you are using. Sprinkle cheese and cook until cheese melts, about 1 minute. This looks amazing! Will have to try this soon! Hi Daisy, I made this! I’m in the UK, and not used to many types of squash (a Halloween pumpkin or a butternut squash is about all I’d ever eaten while at home), but I loved the idea of spaghetti squash (having recently discovered treating courgettes as pasta). I made this with tinned cherry tomatoes as now is not a good time for fresh tomatoes in the UK, and found the squash at the fab local farmers’ market near my home. It was absolutely delicious, and my husband, a pasta and meat / sausage lover, also voluntarily said how nice it was (I’m trying not to prompt him as much into admiring my food these days!). I made mine in a slightly too small casserole dish, which meant some of the squash didn’t get saturated with sauce, leaving a lovely sweet just-squash bit of the dish too! Thank you for giving us food-happiness with this lovely dish! Nuala, thanks for visiting and letting me know how much you enjoyed the squash recipe. It was very nice of you to let me know. We love the idea of a classic dish with a twist. This dish would make the perfect winter warmer! This is gorgeous, Daisy, and I totally agree with you regarding the roasting — it takes more time but it makes such a difference to the flavor to let the squash’s natural sugars slowly caramelize. 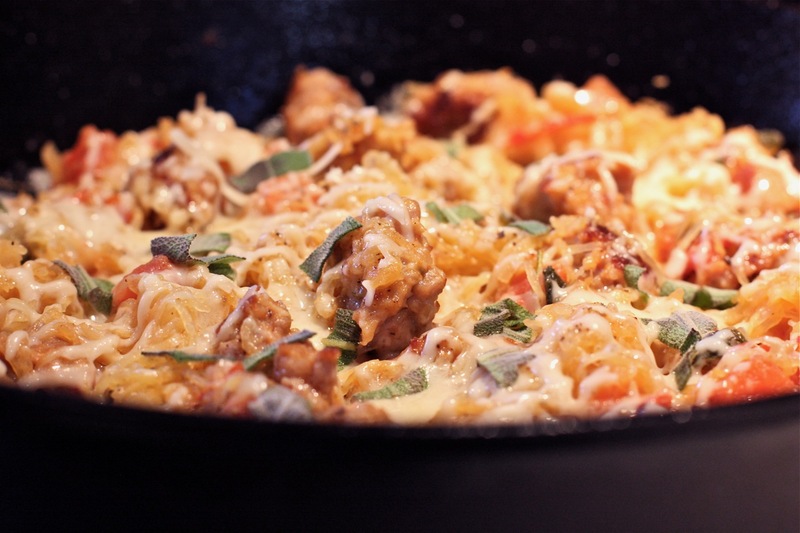 I have just got to get one this spaghetti squash band wagon—your dish looks fabulous! I just got a spaghetti squash in this week’s CSA box and I wasn’t sure what I was going to do with it. So glad I came across your post. Thanks! I love the addition of sausage, my son would too! I’ve usually just done a vegetarian bake.. this looks so yummy! Thanks! I am such a carnivore that I will always find a way to add meat to vegetables to make them more palatable to me. This is a great way for me to eat more veggies! Thank you! Now that I’ve discovered spaghetti squash I’ll have to go to your site and others to find more recipes. Run, don’t walk, to the nearest market! Thanks for visiting, Jasline! Fantastic, Daisy! I love the way you’ve done this – very appealing. Thank you, frugal! You’ve been an inspiration for this type of cooking. Never tasted a sausage!! Am sure it would have tasted yummy yumm..